I’ve been working from home for a few years now, and finally have a setup I’m happy enough with to write a bit about it. Monitor: 40" Samsung UN40MU6300FXZA 4K television. About a year ago I decided I wanted lots of screen real estate and to have my default font size really large. I couldn’t find many reviews that were helpful, and so I bought this particular TV a little randomly. I asked the guys at Best Buy if I could bring a laptop in so that I could preview files on it, and they said no. How I use it: I often have a bunch of windows open, and I look at big tables of things a lot — often in Excel. The resolution for that is great. Browsers, Slack, and OmniFocus were all pretty easy to get set to a zoom level that I like. (My vision isn’t awful with glasses, but it isn’t great, either.) Since I bought this monitor, my vision seems to have improved, which I didn’t expect. Evernote isn’t as easy to adjust the view of as I’d like, but it isn’t too bad. The hardest part about having a monitor this big is that the menus are all waaaay up there in the upper left hand corner. The second hardest thing is that mouse movements are bigger and somehow easy to be clumsy with. Overall, these two disadvantages seem minor compared to the major comfort and convenience gains from the huge screen. I’d definitely recommend this particular television, but I haven’t tried any others. When I bought the monitor, I had a Mac laptop that was working fine, but it was too old to support such a big monitor, and so I had to buy a new one. I tried a cheaper Mac Mini first, but it couldn’t handle the basic stuff I do, so I returned it and got this one, which has no trouble with all the apps I run, including Anaconda, which I use for python. Yesterday I ran into my first problem (I’ve had this setup for about 7 months) when trying to use pandas to open a 24 GB .csv file — I finally had to give up and just open the first 100K rows. I’ve got a standard Mac keyboard, a Logitech M510 programmable mouse (absolutely awesome) that I’ve got programmed with copy and paste, which I find incredibly useful. I keep programming more keyboard shortcuts, but I seem to forget about them. I’ve also got a Logitech G13 Gaming keypad. I don’t play video games, ever, but I’ve got a bunch of excel keyboard shortcuts programmed into it that I find really useful. I’ve got a Quirky power strip, and next to it an arm for my webcam. I took Wirecutter’s advice and bought a Logitech webcam. I do a lot of web meetings, and so I needed something. Honestly, this webcam is way too high resolution for my taste. Every wrinkle shows up, which I regret when my face is on an 80" screen in some conference room somewhere. Fortunately people don’t hire me for my looks. It also shows a really wide view, which in my not-huge house is unfortunate. Behind me is the kitchen, and so I’ve got command hooks that I can hang Target curtains on so that people don’t see my dirty dishes. (That’s what’s folded up on the stool in the photo.) The arm is really useful because without it the camera has to sit on top of the monitor, which is way too high. It also makes it a lot easier to aim the camera towards the backyard, which usually looks neater than the house. I’m embarrassed at how long it took me to search for this arm on Amazon. My monitor is held up by books wrapped in brown paper. Why it is so hard to find monitor stands? There’s a shelf sitting on top of the books. There’s another book under my keyboard, because the Ikea table is up at max height and was still a bit short. The legs are here. (I’m tall.) 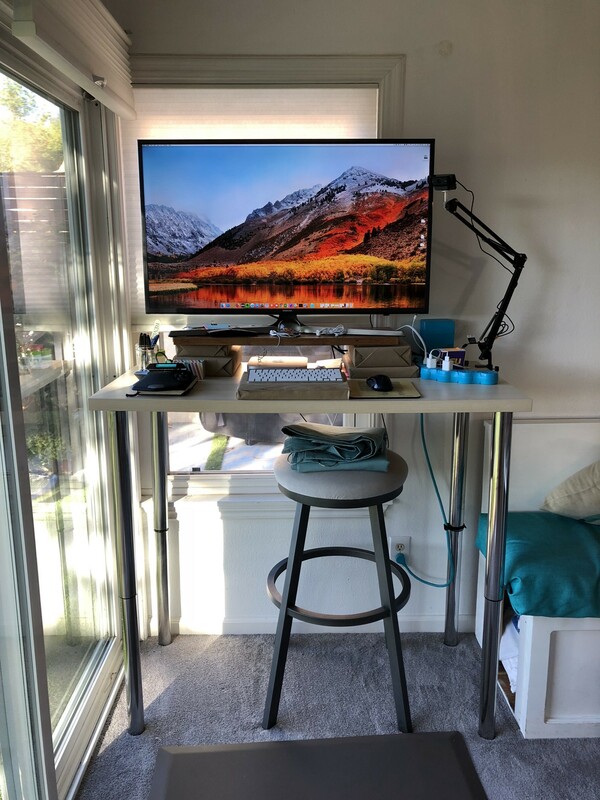 People ask me a lot why I don’t have an adjustable standing desk — it is because this space is very small, and the adjustable desks I could find were either too small for my monitor or too big for the space. Finally, there’s the Imprint mat, which is terrific. I have pretty soft carpet and a thick pad underneath, so I didn’t think it would make a difference, but it really does. I’ve continued to use that old laptop for the past 7 months, but it has been slowing down some, and the resolution seems awful compared to my big monitor. Yesterday I bought an iPad Pro 12.9" and Apple Smart Keyboard and hope to use it when I’m out of the house or traveling. It won’t do everything I do on my desktop, but that’s okay — I like to have an excuse to keep the complicated stuff for when I’m at home, anyway. So far I’ve been able to switch between the 1Password’s browser (great since I have to log in to everything), Slack, and Gmail easily enough to get through lots of correspondence and Q&A, which is what I’m most likely to need to do away from my desk. I actually like reading my email a lot more on my iPad than on my desktop. I use several Google hosted email accounts, and until recently I read them with Postbox on my desktop. A recent error notification avalanche seemed to kill Postbox off, so I switched back to the browser view, which I’ve never loved. I do really like the iOS app, particularly on the iPad screen. Email is less of my job all the time, so I may move to just doing most email through the iPad anyway. We’ll have to see how it goes. Most used apps: Firefox, Safari, Chrome, Anaconda, Evernote, 1Password, Harvest, Skitch (save me, Evernote, you’re my only hope! ), Excel, OmniFocus, Slack. Apps I wish Google would make: desktop versions of Gmail and Calendar. I know they won’t, but a girl can dream.